Hmm, sounds like a conspiracy to me. Sorry about the trauma, so as he wishes, here is what he left to be published on this site, with my responses. Hello, I came here after reading Dan Porat’s The Boy, where some of the Hillersleben photos feature. Hi. Yes, I was consulted by the author, and helped him get some of the photos of the liberation- which was at Farsleben, not Hilersleben. Maybe I am missing something here, but the people on this train don’t look like walking skeletons to me. German civilian rations were 1600 calories pro Tag 1944/1945, so the fact that the photos you present show individuals that look slim but hardly starved seems to undermine your central thesis – namely History Matters. Clearly, you don’t think so or you would use your material more carefully. "A woman and two children rest next to a stopped train" 4-14-2011 by Harry E. Boll. USHMM Archives. Clearly, it was not I, but a soldier who referred to the victims he cared for as “walking skeletons”. Also, these ” slim” individuals were so weak that many could hardly stand- again, more eyewitness liberator testimony. Maybe the soldiers are lying, something that has been suggested by skeptics before. Several “slim people” are lying dead on the hillside in the background- and the skeptic has missed the point that the ones physically able to pose for a photograph have done so. Many more could not even get out of the cars without assistance-many were dead inside the cars, literally falling out on top of horrified soldiers as they slide open the doors-something the skeptic would have learned had he/she been more thorough in his research of my work. Perhaps he would suggest that the boys in the photo to the left, taken by US forces the day after liberation, are the picture of health. And thanks for bringing in the plight of the unfortunate German civilians. Perhaps we should compare suffering here as well. I think a little ironic that the post above the one that the skeptic commented on mentions the sacrifice and not the train liberation at all(“Hell came in like a freight train. I heard an explosion and went back to where my friend was.” 67 yrs. ago this week. ), a common thread throughout my work, which he must have run across if he used the link in Porat’s book to get to this site. And it is also stated at the bottom of my “About” page, which the skeptic should take the time to read before invoking one’s “skepticism”, that “if you are a Holocaust denier/minimizer/revisionist, and/or run-of-the-mill hate spewer, thank you in advance for sparing me your epistles… I’ve already heard it all.” It really can get tiring, but thanks for writing to remind me that I have a better job to do. Sadly, I’ll also be adding the word “skeptic” to my list. And while I usually refrain from posting photos such as will follow, unfortunately it feels necessary now. 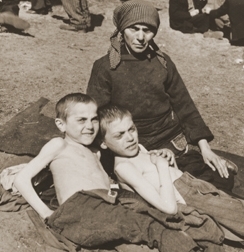 The train survivors left this camp 12 days before this photo was taken by British troops. 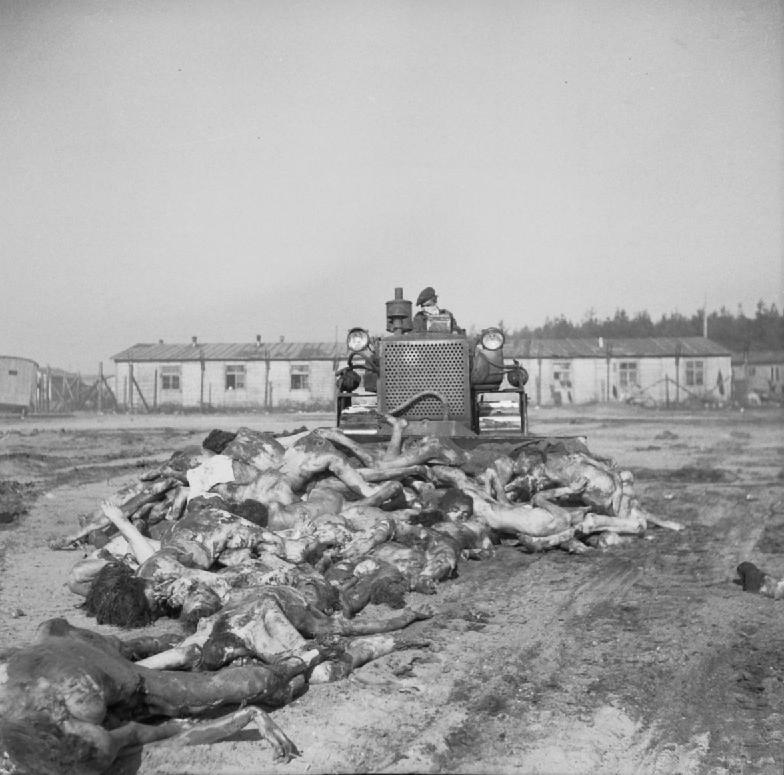 THE LIBERATION OF BERGEN-BELSEN CONCENTRATION CAMP, APRIL 1945 part of "WAR OFFICE SECOND WORLD WAR OFFICIAL COLLECTION" (photographs) Made by: No 5 Army Film & Photographic Unit A British Army bulldozer pushes bodies into a mass grave at Belsen. The driver of the bulldozer wears a protective handkerchief over his mouth and nose.